Well, finally I get to chat with a fellow Canadian (and he won’t be the only one in this series, but you’ll have to stay tuned…)! My interview guest today is Douglas Smith, an award-winning Canadian author of fantasy, SF, horror, and supernatural fiction. Doug is from Ontario, and his work has been published in twenty-five languages and over thirty countries around the world. He’s a three-time Aurora Award winner and has been a finalist for the international John W. Campbell Award, Canada’s juried Sunburst Award, the Canadian Broadcasting Corporation’s ‘Bookies’ award, and France’s juried Prix Masterton and Prix Bob Morane. He keeps a website at http://www.smithwriter.com/. SDR: As I’ve asked the others, please tell us a little about the story you have in the Short Flights bundle. 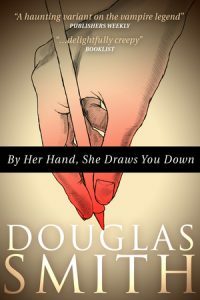 DS: In “By Her Hand, She Draws You Down,” Cath, a beautiful sidewalk artist, is driven by a mysterious hunger that feeds from the portraits she draws of her victims. Joe loves Cath, but as Cath’s hunger grows, so does Joe’s fear that one day she may draw him down. The story was described as “delightfully creepy” by Library Journal, which was just the reaction I was hoping for. 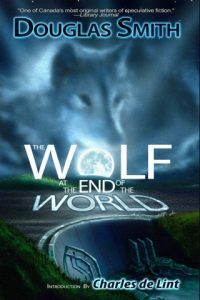 It was a finalist for Canada’s Aurora Award and was selected for The Mammoth Book of Best New Horror that year. The following year, an indie film maker adapted the story into a 30-minute short film of the same name that went on to a batch of awards around the world when it toured festivals. SDR: It does sound delightfully creepy! Do you remember what sparked the idea for this story? What was it? DS: I was staring out a window, the window of a bus to be exact. I wanted to write a story about creativity, but a form of creativity other than writing. Maybe the constant flow of visual images flashing by the window led to the idea of a story about a visual artist. From there, I thought of the portrait artists that I’d often seen during family visits to Ontario Place, a lakefront tourist attraction in Toronto–and Cath and her situation was born. I also wanted to try my hand at a pure horror story, something that couldn’t be classified as anything other than horror. I don’t know where the idea came from to start with a poem, and I can’t remember if the poem led to the rather long title, or the other way around. But once I had the poem, I had the story structure: single point-of-view, told in four sequential scenes, each introduced by a line of the poem that opens the story. SDR: Why do you write short fiction? Love, necessity, marketability, or something else? DS: I’m writing solely at novel length now, but will always keep my hand in writing short stories. I strongly believe that short fiction can help a writer in their craft and career in multiple ways: learning the craft of fiction; experimenting with styles, voice, story structures and points of view; testing the waters to see if editors are willing to pay money for your work; building your resume of writing sales; exploring and building ideas for novels; using short story tie-ins as loss leaders and giveaways to promote related novels; building a network of editors and contacts; raising your profile with award ballot appearances and wins; learning part of the publishing business, and many more. 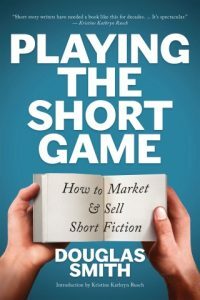 I go into the benefits of short fiction and how to use short fiction as a foundation for a writing career in my writer’s guide, Playing the Short Game: How to Market & Sell Short Fiction. SDR: You’ve obviously put a lot of thought into short story writing–what’s the most perfect short story you’ve ever read? DS: “The Story of Your Life” by Ted Chiang, which was recently adapted into the movie, “Arrival.” The movie was excellent but the story was much better. SDR: Are you a planner/outliner/architect or a pantser/gardener/discovery writer? DS: I’m a “headlights on the highway” writer. I wish I could tell you where I first came across that term, but I can’t. But it fits my approach. I think of it as a compromise between outlining and pantsing. I’m a character-based writer, so I can’t / don’t start until I know my main characters. I know where I want a book to end up at the climax, and I generally know the main “tent pole” events in the book, typically the big turns, events, or surprises that happen, generally end of Act 1, 2, and before the climax. Then I just start writing, usually with the next 2-4 chapters outlined roughly either in the ms or in my head. If I’m happy with where those chapters go, I move on to the next batch. If I’m not, I fix / change / redo that batch. The “headlights on the highway” metaphor comes from how the approach resembles driving across a desert at night. You know the highway will get you to your destination town, but you’ve never driven it before. You don’t know what twists, turns, crossroads, etc. you’ll encounter. But you can see enough of the highway ahead of you with your headlights to keep driving. It’s an approach that lets you make discoveries along the way, but still keep control of the overall direction of the book. Most of the cool things that show up in my stories come from this approach. I know I’d never have discovered them in an outline. The story is discovered in its writing, as someone said. Yeah, I’m not great at attributing quotes. Do you think there were early influences as a reader that have guided the stories you create as a writer? What were they? DS: Not sure, but I’ve always been fascinated by shapeshifter stories and have my own Heroka series. That fascination might have come from an early love of anthropomorphic animal stories like those of Beatrix Potter and the “Freddy the Pig” book by Walter Brooks, and later the work of Jack London. SDR: Do you prefer music, silence, or some other noise in the background when you write? If music, what kind? DS: I tend to prefer to listen to classical music when I write (with headphones, since I’m often writing in a library, coffee shop, or public place). It drowns out the background noise, since conversations can be really distracting to a writer (we love to eavesdrop). Instrumental music, no vocals, and preferably baroque or early classical. Vivaldi, Corelli, Bach are all good. Their music is more cerebral than emotional, which makes it perfect for writing. SDR: Tell us about your other works, projects, publications, and what’s on the horizon next. This is the shameless self-promotion portion of the interview! SDR: Well, thanks for stopping by for a chat, Doug! And thanks for being part of the bundle. The Short Flights bundle from BundleRabbit is available now across many online platforms. Along with Doug’s story, you’ll find nine more single stories and five full collections in the bundle, enough short fiction to keep you reading for a while! At just $4.99, it’s a real steal, so don’t miss it.